That’s me in the picture finishing off one of the hardest things I had ever physically done. 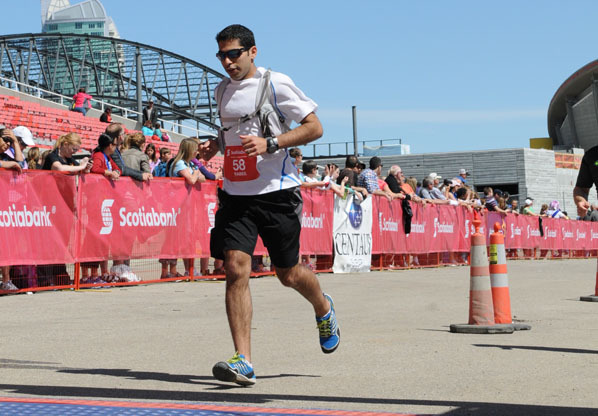 The 2013 Calgary Marathon. That year, and the one leading up to it, was probably the healthiest and fittest year of my life. I felt great, I had an abundance of energy, and I could do things that, today, would almost seem impossible. In coaching, we believe that your well-being is the foundation of anything and everything you do in life. Think of building a high-rise building, you wouldn’t want to build it on a foundation that is full of cracks and missing rebar and all the things that are needed to make it sturdy? Would you? There are different facets to your well-being: physical, mental, emotional, spiritual, and your overall “lifestyle”. When all of these are at their best is when you are at your best. It is when you will produce your best work and achieve your greatest results. Your physical well-being is comprised of your physical health, your physical activity, and your overall energy. Some examples of things that help you maintain and improve your physical well-being are: getting enough sleep, exercise, doctor visits, and diet. An increased focus on physical well-being ensures that your body is supporting you on your goals or dreams by being ready for the challenges you face. Things that contribute to your overall mental well-being include managing stress, anxiety, work and home environments, as well as social and community environments, to name a few. Your mentality plays one of the biggest roles in terms of determining whether you succeed in achieving your goals. The example of me running the marathon in 2013, was the perfect example where my mental and physical well-being were battling each other. Without my mental health, however, I would not have crossed the finish line. In fact, it was the combination of both, and other aspects of well-being that afforded me the ability to complete that goal. The amount of play, laughter, love, and acknowledgement you have in your life all impact your emotional well-being. All of these play a role in how we perceive ourselves, how we think others perceive us, our confidence, the amount of power we think we have, all of this determines our overall emotional well-being. Ensuring we have enough play, love, and acknowledgement in our lives energize our soul and allows us to be more effective and impactful in our day to day and life endeavours. Access to the spiritual side of things, whether it is god, the universe, or spirit (let’s call it GUS) provides another access point to more power and a stronger foundation for the work of our lives. By tackling things on our own, we are limited by our capability. When tackling things with the help of others, we substantially expand our capability. If we take this one step further, and add GUS to our repertoire, we essentially elevate our thinking of what’s possible and begin to believe in things beyond our power. When we believe that this power is within us, we become the highest version of ourselves and even more becomes possible. It’s all a mental state so take what you will from this part of the post - but it’s somewhere to look into for sure! Your lifestyle plays a big role in terms of what you can produce in this world. Ultimately, your lifestyle needs to be aligned with your beliefs and your values, and it also must support your overall well-being. Your lifestyle, in a way, is the instantiation of everything that you are, at the present moment. How you bring everything together ultimately shows up in how you live your life. Where this becomes interesting is when your lifestyle isn’t aligned with what you’re trying to produce in life. As an example, if going out to the pub every Friday evening after work is part of what you do and how you keep in touch with your friends, yet this is causing you to over drink and waste away a Saturday morning, not allowing you to do all the things you want to do, then how do you ever expect to achieve what you want? Sometimes shifting your lifestyle to align with your values and beliefs is the hardest thing you can do, however, it is one of the most critical things. Once you are aligned, you are more able to produce the results you want. For you to achieve your goals and dreams you must nurture and care for all these different facets of well-being. Each dimension of your well-being is impacted by the other. Ultimately, your mind, body, and soul must all be in harmony, they must all be nourished and cared for, and then, and only then, are you able to produce the greatest version of yourself, the one that is able to crush those goals and dreams! Build your goals and dreams on a solid foundation and you will reach heights you never thought possible.